Recently The Whisky Shop team and one lucky customer, Neil Cromarty, joined Glenfiddich Malt Master, Brian Kinsman, to select a single cask Glenfiddich to be bottled exclusively for The Whisky Shop. The cask they chose was a refill bourbon cask filled on 13th March 1992, the year that The Whisky Shop was founded. 1992 was the year the cold war officially ended; the year South Africans voted to end apartheid; the year Disneyland Paris opened and the year Betty Boothroyd became the first female Speaker of the House of Commons. And in 1992, the now gas-fired spirit stills at Glenfiddich were still coal-fired, so you will be tasting whisky history. 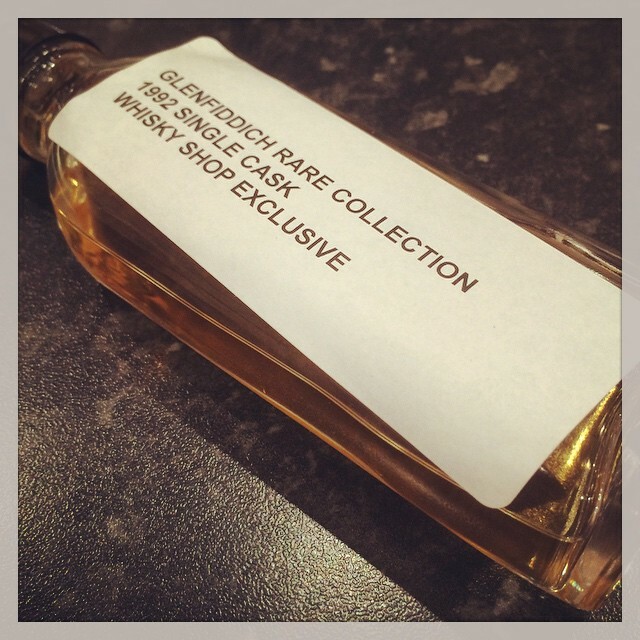 This bottling is the very first cask to be released from the Glenfiddich Rare Collection; casks which are hand selected by Brian Kinsman because they exhibit a host of seductive aromas and flavours typical of older Glenfiddich. The Glenfiddich Rare Collection 1992 Single Cask is now available exclusively from The Whisky Shop and is limited to only 200 bottles. Nose: Relaxed, rich old malt. There’s touches of barley, some gentle citrus, hints of over ripe fruits which soon disperse with time leaving thick vanilla and milk chocolate. Yum. Palate: The palate is thick and lead by some oak sappiness before going back to barley and gentle sweetness, touches of vanilla, a pinch of spice and hints of smoke from the cask. Finish: The finish is gentle, slowly warming as it spreads over your chest… at first quite fresh on your palate, think eucalyptus tones before leaving barley sweetness and tannins. Water: Quite drinkable without, however at the strength a drop is fine, plus it makes your money go further! A drop of water doesn’t change the nose much, but does bring out a few more barley notes. On the palate it reduces the spices and tannins a bit, which for me makes the dram that little bit more more enjoyable, the sweetness comes out easier. Thoughts: A 22yo beauty from Glenfiddich, a very relaxed summers evening dram, one to be savoured on a long barmey summers evening while the sun is setting. The nose is my favourite part of it, the rest is great too however. Available: The Whisky Shop – £1,200. Thanks to Whisky Shop of the sample.